This article was first published February 2015 and has been updated. 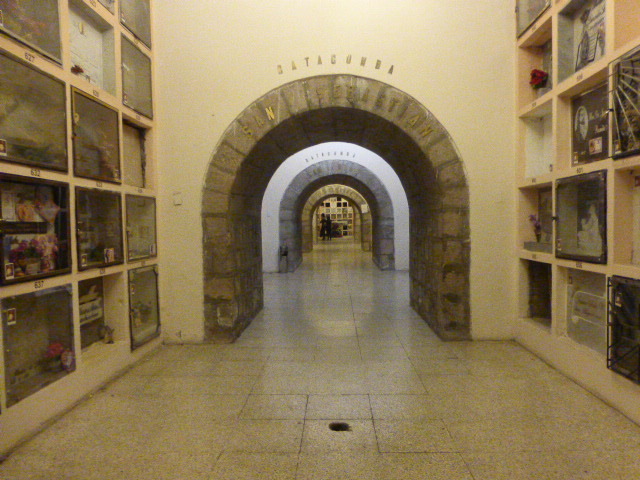 Arriving in Quito, Ecuador on ‘The Day of the Dead’ my friend Marcel and I managed to wangle our way into the crypt which is underneath the Basilica. Normally only open on this one day each year to the relatives of the dead whose remains are interred in little holes in the walls, we tried to look like locals as we sidled past the guards on the door. We respectfully spent half an hour or so wandering around the tunnels where families were dusting out the cobwebs in the little alcoves and replacing the plastic flowers, photos and statues of this saint or that virgin and generally just giving everything a bit of a spring-clean. It was very different to the bright, colourful ceremony that we had passed in our bus earlier that day up in the mountains, although I do like the tradition of everybody remembering their loved ones on the same day. Rather than individuals dealing with their personal loss on various anniversaries of birth, death or Christmas whilst the rest of life goes on around them, the Day of the Dead allows a collective understanding and empathy with others. As our bus had driven out of the mountain town of Otavalo earlier that morning we had got caught up in a traffic jam outside the main cemetery where the majority of the indigenous population bury their dead. The roads around the cemetery had been packed solid with people and families laden down with baskets and flowers as whole families decamped to the graves of their ancestors where they held picnics. The picnics which always included the dead person’s favourite food were actually spread out on top of the graves and everybody sat cross legged around. The ‘Day of the Dead’ which is celebrated all around Central and South America and Mexico is a day of celebration rather than sadness and it was never going to be any more colourful than in that rural cemetery. 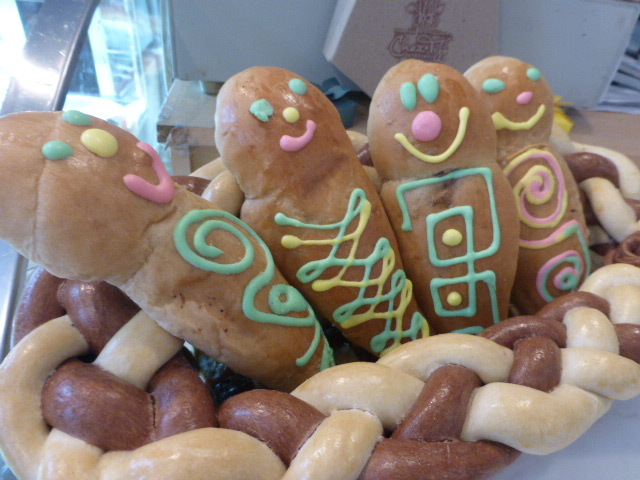 To further cement the collective remembrance, at this time of the year many of the shops and restaurants sell little images of people called guagua de pan (bread babies) and a thick, gloopy purple, slightly unsettlingly warm drink called colada morada (the drink is made of corn and blackberries). Both of these seasonal treats are devoured with relish everywhere. Reflecting on the previous five years. As I update this article nearly five years after I had first published it, I reflect upon how my life has turned out. Arriving in Quito after 3 months in a volunteer placement in Peru I was a totally confused solo traveller. My personal life was in tatters and my self-belief was at rock bottom. I often pose myself the question….’what will my life look like in 5 years time’…and I vividly remember doing just that when I was in Ecuador. I never take things for granted and I know that I got to the place in my head where I am right now with a lot of determination, constant questioning and with the support of some truly amazing friends. South America is edgy, dangerous, overwhelming and bursting with life and it was certainly a baptism of fire for me, then recently divorced and with almost zero self-confidence. I am now a Mindfulness Practitioner and a published (ebook) author, (click here for my book, Becoming Stronger through Mindfulness), I support and guide others along their paths of self-discovery and I continue to travel. At the end of this article I will post some useful links to resources that you might like if you are about to head off on your own journey – and if you are not quite ready to do that yet and you would like some guidance about how to learn to believe in yourself again, drop me an email. I would love to hear from you. Things began falling into place for me in South America and one day in Quito when I was out for lunch I met a lady from Canada who was visiting the city. It now always makes me smile when this happens because one of my main worries before I set off on my adventures, and that of most solo travellers is of how you will meet people when you’re on your own; but back then, I didn’t realise how frequently this would happen. In the end we didn’t take the cable car as there was incredibly low cloud over the entire city but we went off for a morning’s shopping in a large craft market and drank some more of the purple colada morada. Quito stretches the length of a long narrow valley and in just about every direction there are mountain peaks, volcanoes and clouds. There is something so special about the clouds above the Andes. I don’t know how the sky can appear to be bigger and more expansive but here it does, and because in the mountains you are high up, the clouds sit lower over you. They can certainly affect the mood of the city trapping the air in when they press down grey and menacing, or stealthily creeping and flowing down the surrounding mountains like soft grey rivers of fog or, when there are no clouds at all, it’s as if your spirit is free to soar and fly up and away into the universe beyond and here I was enjoying it with a lady that I had only recently met and looking forward to my next destination. However, I’m getting all poetical and I digress yet I still have to tell you about my last amazing day in Ecuador. 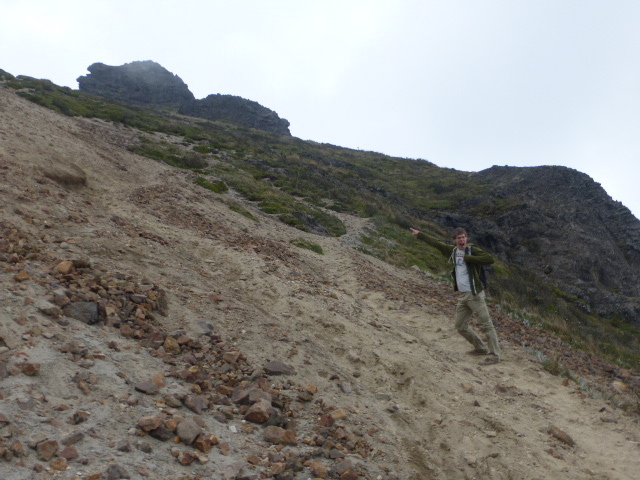 Marcel and I decided to climb a volcano. We were joined by Rachael who was new in town and staying in the same hostel as us and luckily for us the clouds were way up high on the day that we set off for the cable car called the TeleferiCo. Quito, the capital city of Ecuador sits at an altitude of 2800 metres and is the highest official capital city in the world. It has more than 1.6 million inhabitants…and it literally sits around and up the sides of an active volcano which last had a significant eruption as recently as 1998. These South Americans are a hardy lot and they don’t let a little thing like an active volcano bother them – they have even built a cable car system up the side of this one! Unlike many other cable cars in Latin America such as those in Medellin or Manizales, this cable car in Quito has been built mainly for tourists and it whizzed us fast up the side of the volcano. Or at least it was fast once we’d got onto the thing. Rachael and I had to restrain Marcel who with his German scientific mind could not believe the method by which we had to get onto the system. In fact there seemed to be no method. Despite the steadily growing queue, if you wanted a whole cabin to yourself then you could have a whole cabin to yourself and damn everybody else behind you! In the end, Marcel cracked and escaping the clutches of Rachael and me he jumped the queue and strode into a cabin with a family who had hoped to have it to themselves. Once onboard the Teleferico it whisked us up to 4,000 metres and some absolutely stunning views of the city. The ride costs twice as much for tourists as locals and is quite expensive by South American standards and in my opinion you shouldn’t bother going unless you have a clear day. But we were lucky and we had a stunning wide-open sky kind of day and we were not here only for the ride. We were here to climb a volcano. It started out just like a walk in the park. But an altitude affected heart thumping, heavy-limb uphill sort of a walk in the park. A grassy ridge led us up and up for more than an hour and very gradually the sharp craggy rocks of the summit came into focus. 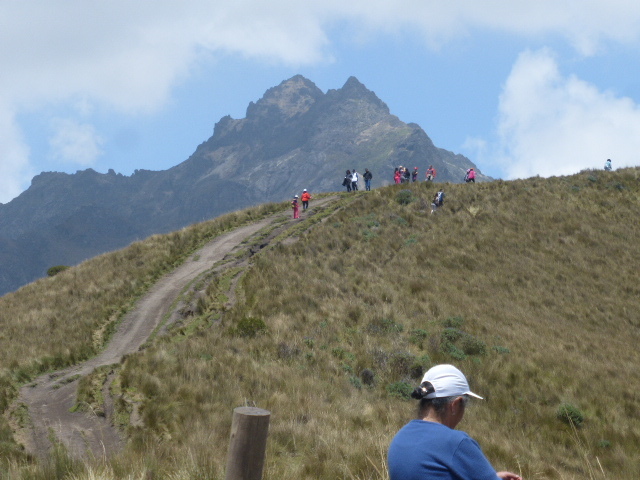 People use this volcano as a training ground for altitude and groups of runners – runners!!! 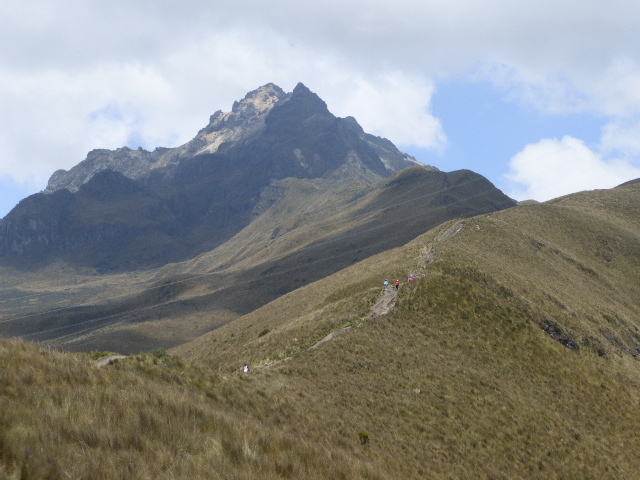 – I could barely put one foot in front of the other at this altitude – groups of runners puffed past us. In the cafe there was an oxygen bar where, for a few dollars you could buy time at an oxygen point and sit with a mask on and revive yourself. 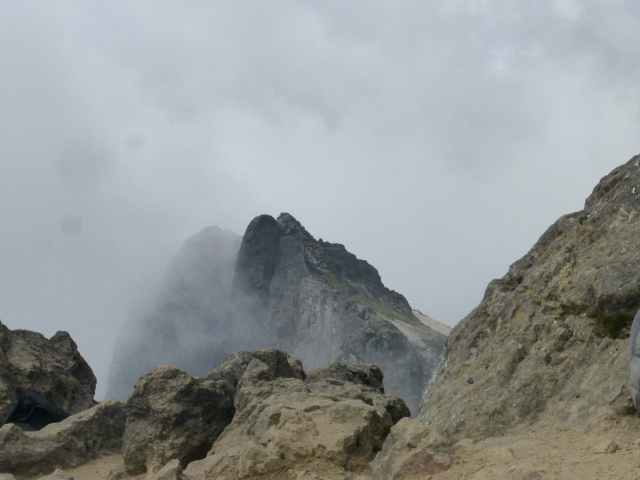 I am never entirely happy with heights and a couple of hours we were faced with the steep side of the sharp peak. Here I have to thank my two friends who encouraged me up – at times using hands and feet and climbing up the rocks. It was tough going but we passed people on their way down who told us that the effort was worth it. The clouds began to swirl down around us and I was a little afraid of getting lost because in some places there was no obvious path, but onwards and upwards we went. And finally, after much scrabbling, we were there on top of the world. 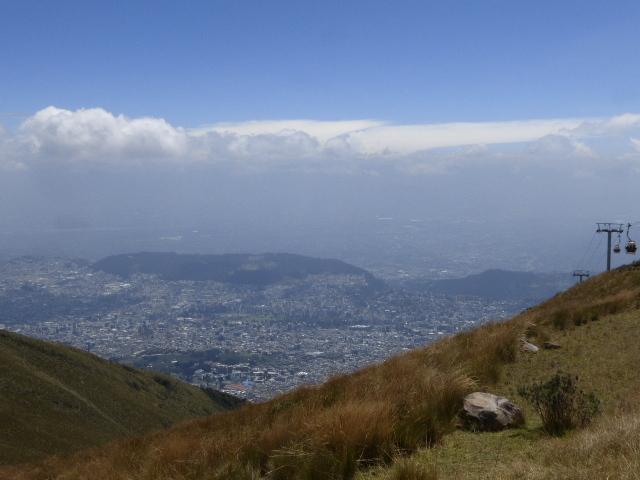 The clouds lifted and swirled and allowed us to see Quito, just a large splodge of dusty colour below and we sat and caught our collective breaths. 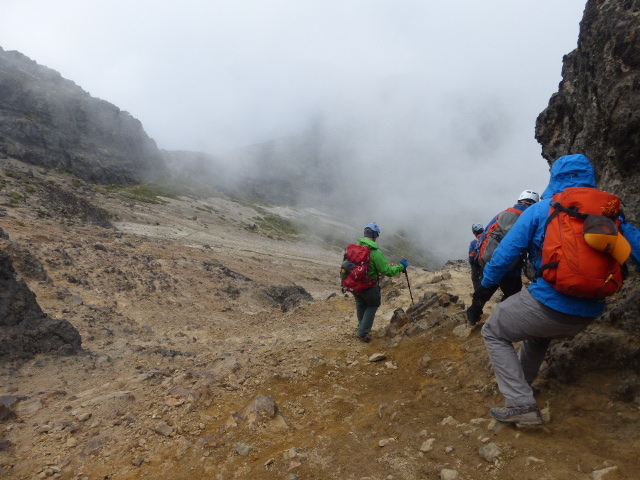 It was amazing to think that we were stood on the summit of an active volcano, 4000 metres up in the sky – but we also knew that getting down was not going to be a piece of cake either. But there was a quick option to get down part of the way. Once past the spiky rocks which were very slowly negotiated, we bypassed the zigzag path and launched ourselves off down the scree slope. This was an almost sheer, almost smooth slope at a steeper angle than 45 degrees and was made up of soft sand and gravel with the odd clump of grass or rock to add an element of danger. At the top you take a deep breath and you launch yourself using whatever method best works for you. Crouch down on your heels and scoot down the hill using your feet as a sled, or bounce down; leaning well back into the mountainside taking giant-sized slithery steps and all the time being very careful not to catch your boot on a misplaced hillock which would cause you to face-plant the gravel. We all obviously made it down in one piece and we caught the cable car back down through the thick fog which had now swallowed up the entire city. And then I was climbing into my bunk in the Minka Hostel for one last time before I would take a cab to the airport and my flights down to Brazil. 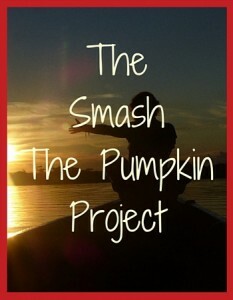 If you are thinking that your life is somehow stuck but you can’t quite put your finger on it, or you have demons that you need to fight before you can move forward, you can get my book here – Becoming Stronger through Mindfulness or trial my self confidence builder, the Smash the Pumpkin Project for a month, click here. 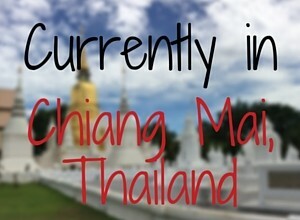 If you enjoy reading about my adventures, do follow me either here or on Facebook. Click on this link and I will also send you a virtual postcard with the odd newsletter attached every month or so. And do take 10 minutes to drop me an email or let me know in the comments what you are up to and what you thought of this article. Aw thanks for sharing your story. Your personal one as well as the travel. One of these days I’m going to be in Mexico or somewhere in South America where I can experience Dia de la Muerte. Way to go for sneaking into the crypt and I loved reading your story of climbing the volcano even with the fog rolling in at the end. Thanks Cheryl. I have been told that the Day of the Dead is an even bigger celebration in Mexico and shouldn’t be missed.